I came across this fantastic piece of art and could not resist sharing it on Cult. 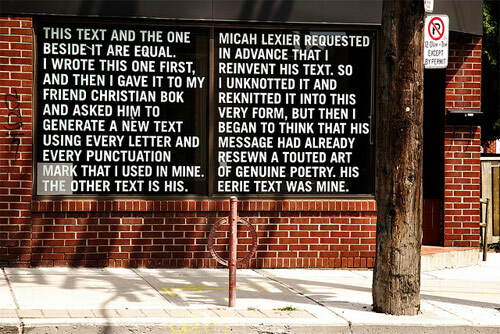 This piece has been designed by artist Micah Lexier and poet Christian Bok. Let me know what you think of this article. Drop in your comments below. @James – The text in the second box used all the alphabets from the text in the first box. Its rejumbled up and written to make sense. First time on this site. Pretty interesting stuff I must say.